One of the most frustrating situations encountered in dentistry today is the referred patient desiring an implant for a recent extraction(s) where no bone regenerative grafting procedure was offered or provided. The site usually has a significant defect, both apico-coronally and bucco-lingually, requiring more extensive and costly grafting either at the time of implant placement or in advance (Fig. 1). Situations like the one described are damaging to patients' confidence in their dental practitioners, as well as frustrating to the surgeon placing the implants when the entire situation could have been avoided with complete patient education at the time of extraction. Prevention for these and similar situations is simple! Every extraction needs to be preceded by an explanation of the risks and benefits of bone grafting in the extraction site. 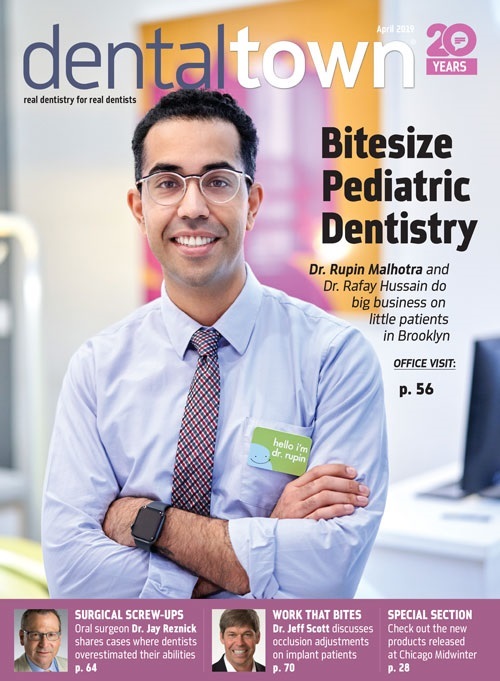 This article includes various reasons why grafting is not provided and why it should be offered, makes suggestions for improved patient acceptance, explains simple informed consent and offers examples of how different patients were treated and prepared for future implant placement. This article does not review an exact technique or include a detailed list of materials. Our goal is to stimulate dentists to find CE courses and become educated on this vital procedure, and to offer bone grafting as an ideal treatment to every patient before extraction. Dentist assumes the patient lacks adequate financial resources for the procedure. Surprisingly, when full informed consent is provided, including the risks of not grafting, using visual aids demonstrating these risks, and the future possibility of implant placement, many patients will opt for the graft, despite the added cost. Often, patients are able to "find" money when they deem something important or necessary. Information about simple socket preservation needs to be explained to clarify the procedure to the patient and justify the procedure. Dentist lacks knowledge of bone grafting options. A dentist who does not provide simple socket preservation does not need to know every aspect of bone grafting materials and/or techniques in detail. However, it is required to know the long-term risks and benefits of providing this service, so patients can make an educated decision on which treatment option will best serve them. Fig. 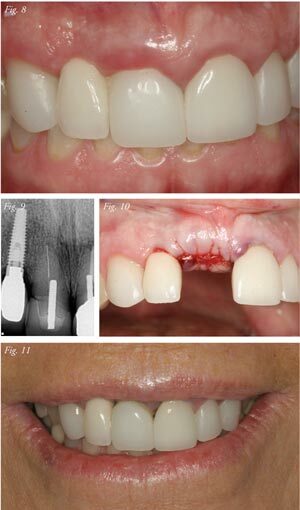 1: Patient desiring maxillary central implants after extractions without socket preservation discussed or provided. Patient ultimately required extensive hard- and soft-tissue grafting with pink porcelain as part of the final prostheses. Figs. 2 and 3: Patient was referred for implant consult one week after general dentist extracted chronically infected, non-restorable maxillary premolar. Early referral allowed immediate grafting of the site. Figs. 4 and 5: Radiographs of grafted site and subsequent implant placement with crestal approach sinus lift. Figs. 6 and 7: Final restoration demonstrating good color match and adequate tissue healing. Dentist desires income of extraction procedure and does not want to lose revenue by referring the patient to another dentist or surgeon who provides socket preservation. This scenario is an ethical dilemma facing a few dentists, and might have risen due to the slowed economy. Each dentist needs to put the patient's best interests first by providing full informed consent as discussed below. Making your personal financial income a priority over the patient's long-term oral health is unethical and should be avoided. Ignorance and frustration. Occasionally, the referring dentist becomes frustrated with those patients who were previously warned repeatedly not to delay treatment and the potential consequences of doing so. This can often take valuable practice time, and leaves the dentist struggling to make-up for the lost revenue. The result is that dentists feel they have already provided adequate patient education from the various previous conversations with the patient, and the dentist starts treatment by providing the extraction themselves, and referring the patient to the surgeon for an implant (with the corresponding bony defect). This scenario can easily be avoided by including staff involvement in patient education. Infections. Often, an extraction is provided when the tooth is necrotic and might have an acute or chronic infection. The scientific literature leans toward avoiding grafting in an acute infectious site, yet providing grafting in a chronic site with appropriate antibiotics. This position has changed over the past few decades and many surgeons use their own experience as a guide as to when to graft a site at the time of extraction. For many dentists, determining whether a site is chronic or acute can be difficult, so they avoid grafting altogether. In this scenario, consultation with a surgeon, or extraction and immediate referral to a surgeon or extraction and recall to your office can allow subsequent grafting within one to two weeks after the extraction (Figs. 2-7). Absolute contraindications. It is commonly stated (and misunderstood) that a patient who smokes or has a previous history of periodontal disease, diabetes, blood disorders requiring medications, osteoarthritis and other chronic illnesses should not receive an implant. Therefore there is no need to provide bone grafting. Although the overall success of bone grafting and implant success tends to decrease in some of the above mentioned patients, they are not considered absolute contraindications. Many surgeons today are able to carefully place implants, provide adequate informed consent about the potential for a decreased success level, and successfully complete the procedure. In the 1980s and 90s, discussion of absolute contraindications was common, but with careful planning, excellent patient education and compliance and ideal surgical preparation and technique, these patients can receive bone grafts and implants that will improve their level of long-term satisfaction with the treatment. Why Bone Graft When Extracting Teeth? Fixed-prostheses might have a poor aesthetic result without the presence of adequate bone and overlying soft-tissue. Figs. 8 and 9: Image and radiograph of failing central incisor next to a previously restored implant placed too far apically. Patient education is necessary before treatment for potential loss of gingival embrasure papilla fill and aesthetic challenge. Fig. 10: Extraction and socket preservation with allograft and soft-tissue augmentation. Fig. 11: Patient smile with provisional on central implant demonstrating aesthetic challenge of filling papilla next to implant. Despite secondary soft-tissue augmentation surgery and appropriate contour of provisional, pink porcelain was necessary. Patient was prepared due to appropriate informed consent. Informed consent involves six areas and should be provided to every patient before any dental procedure. Provide a written document to the patient that explains the various options (as described below) and obtain a signature indicating that he or she understands and accepts the treatment. Use visual aids, including: actual patient photos, casts, educational models and videos to help patients understand the proposed treatment. Most of the patient education can be provided by the assistant, with the dentist answering detailed questions and obtaining the consent. Example consent forms can be obtained from many sources including the ADA, many surgical and implant associations, digital patient education software services (ImplantVision, etc. ), continuing education centers and more. Below are the six necessary areas that must be discussed for practitioners to obtain legal informed consent. Present all treatment options. In regard to extraction cases, all treatment options should include extraction only, extraction and immediate grafting anticipating later placement of an implant, extraction with subsequent grafting in one to two weeks due to infection or other factors preventing immediate grafting, extraction and referral to a surgeon for grafting, referral to a surgeon for entire procedure, extraction and grafting with potential for subsequent grafting later by a surgeon (i.e. sinus lift, ridge augmentation, etc. ), extraction and simultaneous implant placement with grafting to augment and many other options that are specific to the patient's condition. Whatever the option, be honest with the patient as to your ability to provide the service at the same level as a specialist. Discuss the advantages of each option. For this example, the advantages would include improved ability to receive an implant at the extraction site, decrease of further costly grafting procedures and improved quality of life with future implant restoration. Also, discuss the advantages of providing the grafting yourself or referring to a specialist/surgeon. Discuss the disadvantages or limitations of each option. Many of the disadvantages were discussed above in the reasons why bone grafting is not provided. A frank conversation with the patient should occur, being realistic about potential outcomes. For those who provide bone grafting, do not forget to include the risks of rejection or loss of grafts, potential for infection, potential need to provide additional grafting at a later date or at the implant placement, the potential for continuing shrinkage of bone and gingival tissues or aesthetic challenges (Figs. 8-11). Identify and explain the risks of each option. This section of informed consent usually is explained with the disadvantages or limitations of each option, as described above. In differentiating a disadvantage from a risk, it is necessary to explain that a risk is not necessarily a poor choice or will always lead to a disadvantage. Each day, most individuals take a risk to drive to work, but it will rarely lead to an accident if caution and safety are applied. Similarly, a risk is taken to place a foreign substance in the extracted site, but if good infection control measures are implemented with careful surgical technique, infection and subsequent clinical challenges can be avoided. Provide the cost of each option. Base your cost on the compensation that is adequate for your time and expertise. Overcharging a patient initially can result in decreased treatment plan acceptance, decreased future implant placement, loss of patient from practice and patient resentment. Some dentists provide an incentive for those who state they have financial challenges, such as providing the extraction and grafting now, and if the patient returns within a year for the implant placement (when they might be able to obtain the funds or third-party benefit plans allow), the dentist discounts the implant placement. Plan for your patient's future implant placement if they cannot afford to have all of the procedure accomplished at one time (extraction, graft and implant placement). This preparation is in the patient's best interest and can be a great source of future revenue. Discuss the outcomes of no treatment. Although this step is listed last, it might be best suited to discuss lack of treatment first. Explaining the consequences of failing to graft now can motivate treatment acceptance. For a reasonable fee (i.e. extraction fee plus two to three times the cost of the bone graft material), the procedure can be easier to accept than the alternative of extraction, grafting, implant placement and restoration equal to several thousand dollars. Simple socket preservation is within the ability of most dentists who desire to provide this service. This excludes more advanced procedures, such as ridge augmentation, block grafting, sinus elevation, etc., although surgically oriented general dentists can learn these procedures as well. It is important for dentists to obtain adequate education and training on how to provide these procedures within their comfort level. Depending on whom you ask, this education and training can range from a three- to six-year residency, to a multi-session course or to a weekend course. Not all dentists are able to complete a residency, but they might have the potential to provide simple and predictable socket preservation after taking a shorter course. The most important factor to remember is if you provide bone grafting procedures, you are expected to provide it at the same quality level as a specialist. Know your own limitations, who to treat, who not to treat and when to refer. If you are a general dentist who provides bone grafting services, do not abandon your specialists, upon whom you may need to rely for future assistance. If you are a specialist, work with your referring dentists and be a mentor. It has been our observation that working together improves revenue and overall patient and dentist satisfaction. For dentists who desire to provide simple bone grafting, we recommend obtaining the appropriate education, deciding in what clinical situations they desire to provide socket grafting and then implementing the procedure into practice. There are many courses on socket grafting offered to general dentists, most of which are taught by specialists. One of the best ways to improve your skills and confidence is to find a surgeon who will be your mentor. Take time off to observe and learn from him or her. Develop a relationship where you provide simple and predictable services and refer more advanced cases to your surgeon. Most surgeons who develop these types of relationships experience increased referrals from general dentists. With the advanced level of implant dentistry, combined with the large number of patients who need implants, many teeth are being extracted without full informed consent regarding socket preservation. Dentists need to fully disclose all the available options to patients when a tooth or multiple teeth need to be extracted, even if it results in loss of revenue. Most dentists can learn and provide simple socket preservation by developing a close professional relationship with a surgeon. Ultimately, these changes will benefit the patient, the general practitioner and the specialist. Dr. Paul Child is the CEO of CR Foundation, a nonprofit educational and research institute (formerly CRA). He conducts extensive research in all areas of dentistry and directs the publication of the Gordon J. Christensen Clinicians Report, and their other publications. Dr. Child is a prosthodontist, a certified dental technician and maintains a private practice at the CR Dental Health Clinic in Provo, Utah. Dr. Child lectures nationally and co-presents the "Dentistry Update" course with Drs. Gordon and Rella Christensen. He lectures on all areas of dentistry, with an emphasis on new and emerging technologies. He maintains membership in many professional associations and academies. Further information is available at www.cliniciansreport.org. Dr. Gordon J. Christensen is founder and director of Practical Clinical Courses (PCC) in Utah. This group is an international continuing education organization providing courses and videos for all dental professionals. He is also co-founder of the nonprofit Gordon J. Christensen Clinicians Report (previously CRA), as well as an adjunct professor for Brigham Young University and University of Utah. He is a diplomate with the American Board of Prosthodontics. Dr. Christensen has presented more than 45,000 hours of continuing education throughout the world and has published many articles and books. Further information is available at www.pccdental.com.